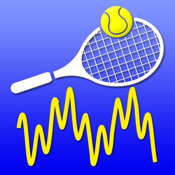 How to use your iPhone or iPad to Measure Tension of your Tennis Strings for only $1.99. Find out when it is time to restring your racket. The tool uses the iPhone's microphone to test the string frequency. It can be adjusted based on the size of the racket, type and gauge of the strings used.